You sometimes might ask yourself why you love to travel. Probable to give a short change to everyday life and experience something special. In other words: to escape reality. Some Hotels really tend to satisfy this desire. 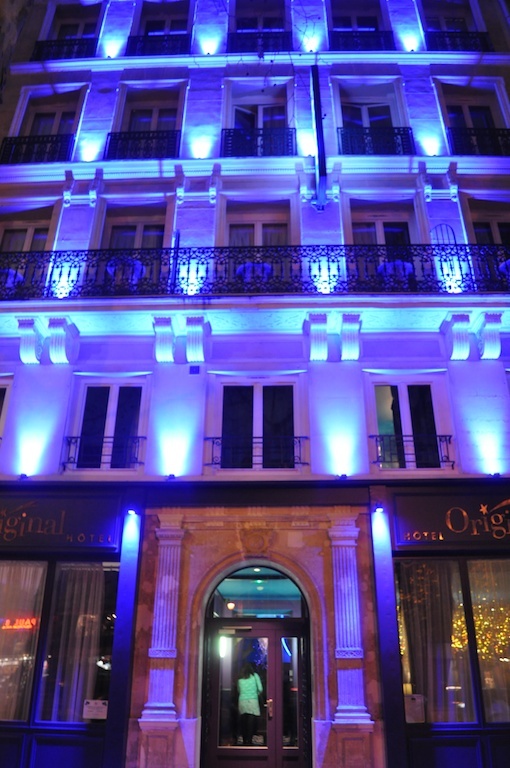 Take Hotel Original: Located in the heart of Paris, you might wonder why you should even leave this place while in town. 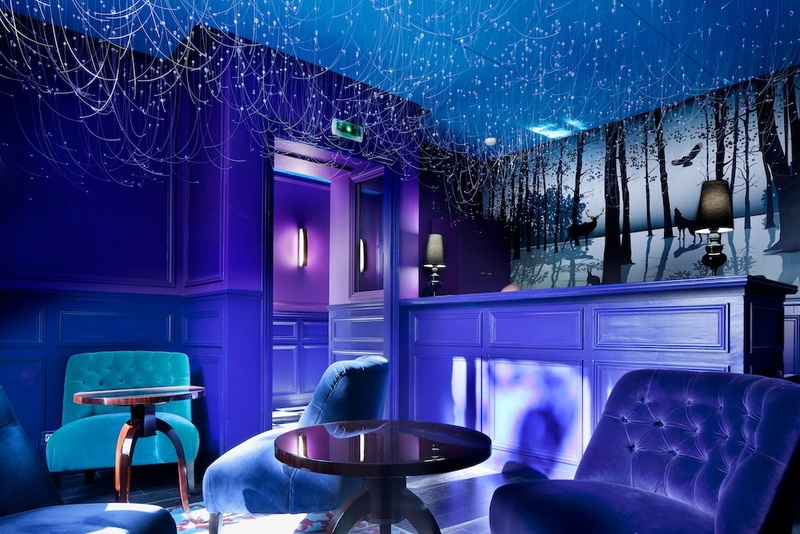 The famous designer Stella Cadente has imagined the interior of this entirely reshaped hotel on Boulevard Beaumarchais, just a stones throw away from Place de la Bastille and the very hype Upper Marais area. If you have an idea of Stella’s fashion style, you might imagine how the hotel looks. She got her inspiration from fairytales and created a surreal, dreamlike universe. 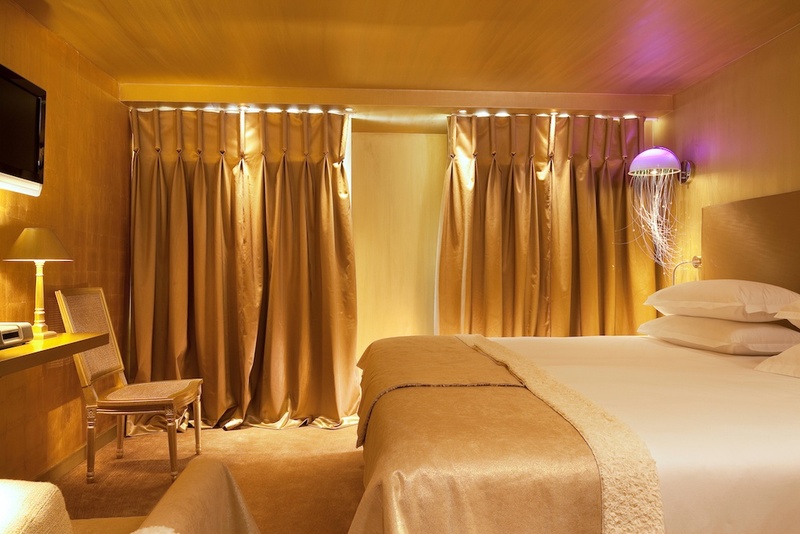 The 38 rooms are all different and each one is like an invitation to dream. The tone is set as soon as your enter the lobby. On your left hand: le salon, a tiny place for breakfast and having a late night drink. On your right hand there is the reception which looks like a submarine place soaked in bluish and purple tones. Strange creatures looking like jellyfishes hanging from the ceiling and giving just a bit of light create a special atmosphere: like it or not, it’s unique, not to say very original. The rooms are all different. Stepping in Reine de Cristal feels like entering an ice cocoon, a pure, but still cosy world of pure white and crystal. It’s inspired by Hans Christian Anderson’s fairytale “The snow Queen”, I suppose. And if among all those rhinestones and crystals you don’t transform yourself into a Queen, you’re beyond help. In case you prefer something more down to earth, take Aux Merveilles, inspired be Lewis Carroll’s Alice in Wonderland. The colours are light purple, striped wit black; the lamps look like rabbits or deer. And if you’re travelling with little kids, it will be perfect for you: the quadruple room has a queen’s bed for the parents and two single beds which you can hide behind a curtain. The kids will love it and feel like Alice disappearing in a rabbit’s whole: You can’t see me anymore? That means: I’m gone. On the last floor there are seven smaller rooms named after the seven deadly sins, all staged in a mix of golden, bronze and brown shades. Some have three single beds: a perfect place for a Paris shopping spray with your two best friends.